Free ebook, for your computer or mobile device. Works with iBooks etc. 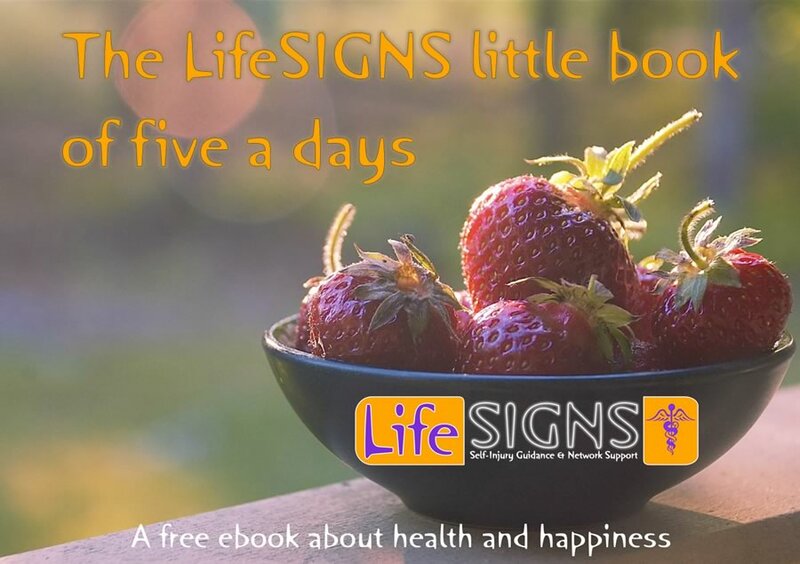 Written by the volunteers at LifeSIGNS, offering different ideas for health and happiness. 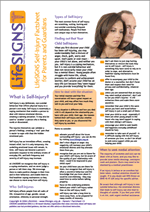 Our fact sheets, below, are free to print and to distribute, as long as you do not edit or change them. We suggest you do not just click the link, but ‘right-click’ on the PDF link and choose to download / save the document to your computer. Then you can open the fact sheet with Adobe PDF Reader. If preferred, ‘right-click’ on the PDF link and choose to download / save the document to your computer. Then you can open the fact sheet with Adobe PDF Reader. Guys might hurt themselves in different ways, and they might avoid talking about self-injury, but it’s not uncommon among men, and you should not assume that self-injury is a ‘girl thing. Download our Factsheet for your mates, and read our Male Self-Injury article for statistics – it’s def not a girl thing. We suggest you do not just click the link, but ‘right-click’ on the PDF link and choose to download / savethe document to your computer. Then you can open the fact sheet with Adobe PDF Reader. Print this for anyone who hurts themself; let them know that they are not alone. If prefered, ‘right-click’ on the PDF link and choose to download / save the document to your computer. Then you can open the fact sheet with Adobe PDF Reader. 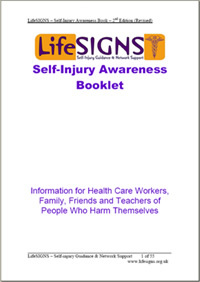 Guidance for employers and managers about staff who may rely on self-injury at times. We hope these free fact sheets are really useful to you. We’re an unfunded small charity and everything you see here was created by people who know self-injury from the inside and want to help people reach their own understanding. We can’t do what we do without your support. 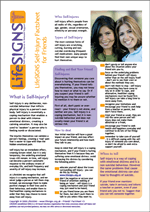 Our two-page handout is useful when considering the emotions driving self-injury, and the intention behind the behaviour. 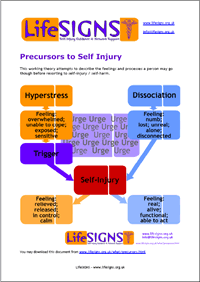 You can view the Precursors to Self-Injury web page too. 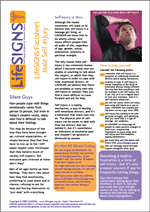 Our 50 page booklet had always been popular and well referenced, please download your free copy. Please note this is the second edition of our booklet, and we will revise it from time to time, but will also re-write it entirely before 2009. 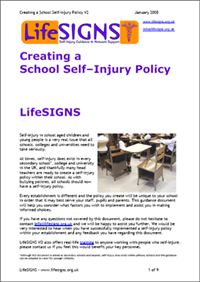 You may print the SIA Booklet on A5 paper, or, you can print 2 pages on to one side of A4. It’s a handy reference file to have at hand on your computer. The Foreword is by Dr. Neil Burley, MB, ChB, Psychiatrist and teacher. 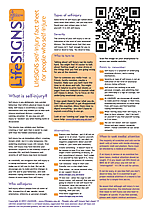 LifeSIGNS (Self-Injury Guidance & Network Support) is an online, user-led voluntary organisation, founded in 2002 to raise awareness about self-injury and provide information and support to people of all ages affected by self-injury. We recognise self-injury is a way of coping with distressing experiences and difficult emotions, and we encourage people to reflect on the issues behind their self-injury, and to develop and explore alternative coping mechanisms. Thank you for sharing this website. I have found it very helpful. Do you have any fact sheets for women. I noticed the friend one is geared towards young people and that there is one for men, but not for woman. 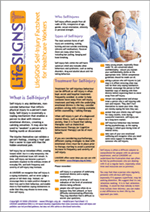 Hi Kathy, the “For people who self-injure” fact sheet is an introduction to SI for anyone who self-injures. Our whole website is for people of all ages and all genders, but we do publish a little extra for adults and for men/boys because these demographics are under-represented in the media. In fact, people often assume that our website is written by women for women, and that is not the case. We plan to write more around LGBT and BAME / POC self-injury – do you think we need to clearly address female issues as well? I’m from USA / San Francisco Calif. Your website by far is the most comprehensive one that I have seen. I have spent alot of time looking for specific info.re: self injury and info. 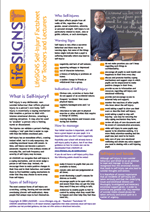 that can be given out to parents, students and teachers for a mental health training that I am doing and then I found Life Signs. Thank you soo much! Do you have an email list that I can join?